Autumn with you today to share a card design which you could use for a 50th birthday or anniversary. 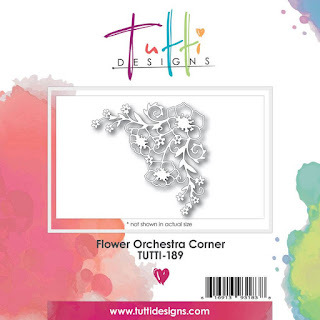 You could also CASE this card with our fabulous new 25th die. Any color scheme will do, this card layout is completely versatile. I created a lacy background layer by cutting two Flower Orchestra Corner dies. I snipped out the center flower from each die and tucked it in on each side of my Nesting Stitched Oval die. This floral die is my absolute favorite die and I love finding new ways to use it! I cut one of the 50th dies from my Maja Design paper and bumped off of a second white cut. I sponged the blue a little along the edges to make it pop more. 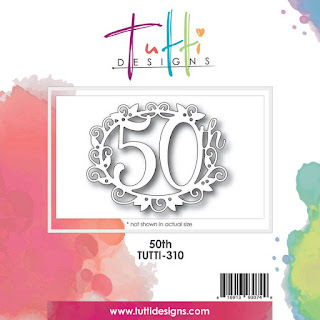 Purchase your 50th die HERE today! WOW! I absolutely LOVE this creation Autumn! What a great idea to put these dies together ... BEAUTIFUL and fabulous inspiration! THANKS! love how you used the corner die behind! I have to remember this. I just used one the other direction but this is so cool too! TFS!